As I have said many times, I get a lot of magazines. They are split pretty evenly between food and mom magazines, which I think is totally normal for a single 30-year old woman with a weakness for cheap subscriptions to publications that trend towards crockpot recipes, “design on a dime” tips, and the occasional Jamie Lee Curtis interview. Or in the case of the January 2012 issue of Woman’s Day, a Valerie Bertinelli interview…with recipes. Nobody was more surprised than me to find myself thinking about one of Val’s favorite book group cakes (Blueberry Buttermilk) days after flipping through the issue, but I thought “Why fight it?” and made the darn cake. And guess what? It came out just like I dreamed it would. Tangy buttermilk mixed with tons of frozen wild blueberries (since it’s January that was my best bet…) in a tender crumb makes for the perfect Sunday morning coffee treat. Also, if sliced into 24 pieces, each slice clocks in at only 188 calories. A classy cake like this would also be a jolly good choice for any of you out there looking for snacks to enjoy while you watch the premiere of season 2 of Downton Abbey this evening on PBS! I have a feeling I will be enjoying a slice with a gin and tonic pot of tea while I roll my eyes at Mary and ponder O’Brien’s curly bangs. Preheat the oven to 350 degrees, and spray a 9-inch springform pan. In a large bowl, whisk together the baking powder, baking soda, salt, and 3 3/4 cups flour. In a medium bowl, whisk together the eggs, egg whites, buttermilk, sugar, oil, and zest. Make a well in the center of the flour mixture and pour in the wet mixture until just combined – do not overmix. There should be some lumps. 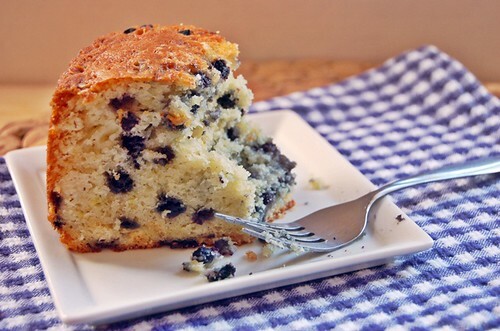 In a small bowl, toss the blueberries with the tablespoon of flour. 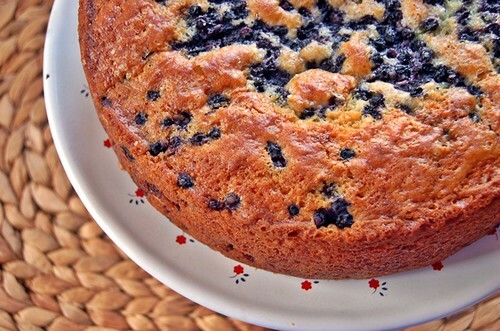 Using a rubber spatula, fold all but 1/2 of the blueberries into the batter and smooth into the prepared pan. Sprinkle the reserved blueberries on top, then sprinkle with coarse sugar. Bake for 70-75 minutes or until cake is brown and a toothpick inserted into the center comes out clean. Let the cake cool in the pan for 15 minutes, then remove the outer ring of the pan and transfer to a wire rack to cool completely. I bet that would taste great – I definitely want to make this again when I have large fresh blueberries on hand! This looks delicious Aimee! 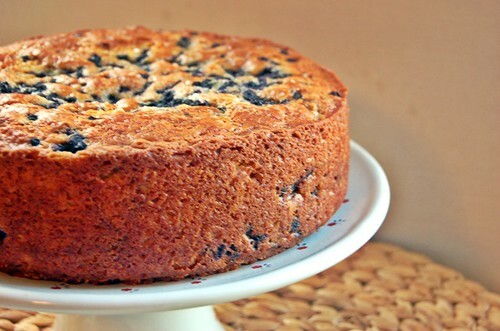 Mmmm blueberry cake…. This looks fantastic. Sign me up for anything with blueberries and lemon. If only I had the ingredients, I would be baking this right now to eat while watching Downton Abbey in a couple of hours! Next week…. I made this cake today and it was delish! Thanks for sharing the recipe.